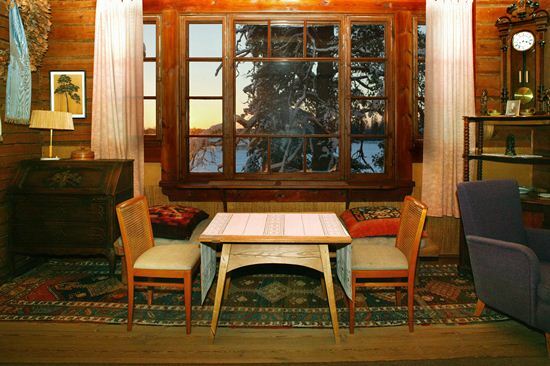 A white Christmas settles around Ainola, the house of composer Jean Sibelius and his wife Aino. Sibelius (Dec 8, 1865–Sept 20, 1957), Finland’s most famous composer, also wrote some of Finland’s most beloved Christmas carols, although he dreaded the darkest time of the year. The Sibelius household nonetheless celebrated a jolly Christmas with lots of music. I know exactly how it feels to have a composer in the family at Christmas time. The entire, big rambunctious household gathers around the piano after a sumptuous dinner with all the Finnish trimmings and around the man who dominates the house. The fervent but sometimes dissonant singing of traditional and, better still, self-composed carols melts the ice outside. For 20 years, I experienced these unforgettable high-spirited holidays with my father-in-law, the Finnish composer Tauno Marttinen, in the cosy wooden house where he and his wife, Ilmi, lived in Hämeenlinna. This city also forms the birthplace of Finland’s most famous composer, Jean Sibelius, whose carols Finns love to sing on Christmas Eve. I imagine that at idyllic Lake Tuusula, where Sibelius lived most of his life with his wife Aino and their five daughters, the atmosphere must have been a bit like ours in that music, composer and family were brought together and joy prevailed. Sibelius seemed not to have been very religious, and talked about his Christianity only as the “faith of my ancestors,” but it is known that he went to church at least once a year, on Christmas morning. He was not especially fond of Christmas time, in any case. Winter doldrums aside, by all accounts the composer enjoyed the time spent with his family when he gave them and their friends compositions as Christmas presents. In 1915, Sibelius compiled five carols from his Christmas songs as Opus 1, composed between 1897 and 1913. 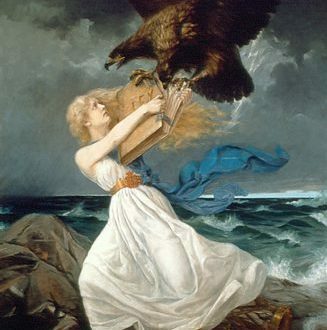 One of them was the hymn “En etsi valtaa loistoa” (“Give me no splendour, gold or pomp”) and another is “On hanget korkeat, nietokset” (“High are the snowdrifts”), both of which rank among the best-loved Christmas carols in Finland. The importance of the carols to Sibelius is indicated by the fact that he reworked them continuously until just a few years before his death in 1957. 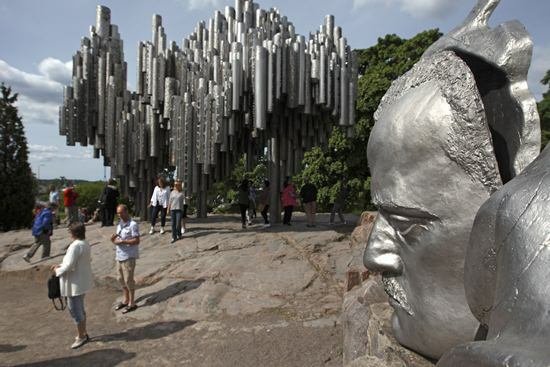 Sibelius composed “Give me no splendour, gold or pomp” soon after he moved in 1904 to Ainola. 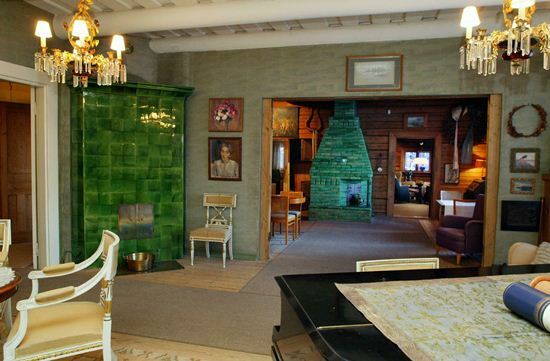 The house was named after his wife and located near Järvenpää, about 40 kilometres north of Helsinki. At his previous home in Kerava, about ten kilometres further south, he had composed “High are the snowdrifts.” In 1943, that song, with lyrics from a poem by Zacharias Topelius, was given a place in the hymn book of the Finnish Evangelical-Lutheran Church, first in Swedish and later in Finnish. At Christmastime Ainola bustled with people. There were the daughters with their growing families, and in-laws and friends dropping in. The house, normally so quiet one could hear a pin drop, echoed with music and game playing and the patter of children running around. And I imagine that smoke from Sibelius’s beloved cigars billowed around them. The house had electricity but no running water – Sibelius didn’t want it. It must have been a challenge for the women as they prepared the culinary feast for so many. Among the delicacies were Aino’s own homemade preserves. 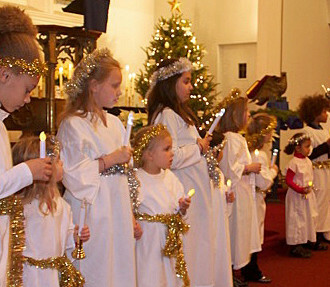 For the children, the high point was the start of Christmas at Ainola. 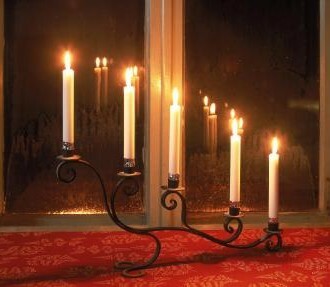 “The children were taken to the dark nursery. They were called to the drawing-room when the Christmas tree was all lit up,” writes his granddaughter Laura Enckell in her recollections of her childhood. Each year, traditional Christmas songs bring together New York’s dispersed Finnish community (includes Top 5 playlist). An American learns what Christmas Peace means while discovering many ways of celebrating the holidays in Finland. 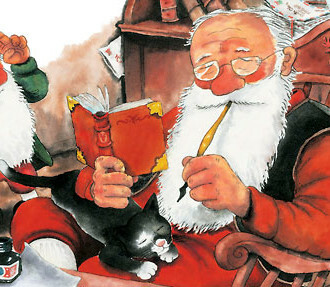 Creator of Claus: Animals, elves and a laid-back Santa populate Mauri Kunnas’s illustrated books, a treasured part of Christmas for kids all over the globe.